Yeah it's Thursday is back! Last year I started a new themed blog called 'Yeah it's Thursday' (I had Thursdays off teaching). It didn't last long, which is disappointing and in a nutshell it was meant to be sustainable as it wasn't long and jusa short list of a few things that I've consumed and thought were worth recommending. A doco, movie, book, podcast, event, etc. Anyway I'm going to try and start it up again and see post 1 of season 2 below. (you can scroll even further down to see what I was digging this time last year!) Enjoy. Description: ALL FOR ONE follows the first five years of the GreenEDGE cycling journey. United by their renegade spirit and a determination to win against substantial odds, these riders take on the international circuit. The film offers unique insights into the first five years of their journey, bearing witness to the ethos of the team as embodied by all – from the strongest to most embattled members. Out of a culture that embraces a deeply human approach to sport, unlikely champions are born, and seemingly improbable team and personal goals are achieved. I remember when this movie came out and the local cycling club had a fundraiser at the movies for its release and I didn't think much of it. On my flight to Tokyo the other day it popped up and I thought I'd give it a go. Wow! It below me away, such an inspiring, motivating and entertaining movie which I highly recommend. I actually watched it again on the way back as well. At one stage I was ready to fist pump the sky but remembered I was on a plane with a couple hundred of people. You can rent it for $6.99 from their website here and if you're into any sport you'll love this one and even as a dedicated runner this is hands down better than any running doco I've watched. One of the best books I've read in years, it'll make you check yourself and the way you deal with other people and think about yourself. It will be a book that I go back to and read time and time again and this quote sticks out for me. Hit up your local library or check it on amazon below. ​Event: Johnno's Run as part of Run Melbourne. Last week we launched Johnno's Run for 2018. Last year we were the biggest team at the even with 230 people participating and raised about $80,000 for Community Living and Respite Services. This year we're hoping to raise even more and have more people involved, you don't have to live in Echuca/Moama to join so check out the details here. I'll be at training every Monday night at 5:15pm down Scenic Drive and hope to see as many locals as possible there. Peter Norman Reflection for the Catholic Education Office of Sandhurst. When I was a kid and teenager and even a young adult I hardly ever read. Over the years though things have changed and I've immersed myself in books. In a way, I regret not picking up books earlier as my reading list is getting bigger and bigger and it would of made it a bit more manageable if I got an earlier start to get through them, but, in saying that I'm glad reading has come into my life regularly in the last few years. I'm not sure why it took so long, Mum always read and was a good role-model, things like this just happen when you're ready though. I find reading relaxes me and gives me a great amount of knowledge in a range of areas. Usually I read self-help kind of books. Carley tells me I need to get better at implementing a few of things I read but at least I am planting the seed when I get the knowledge. I also read a stack about running, food and health. They all interest me as I can take things straight out of those texts and implement in my own life immediately. Chuck in documentaries and podcasts and we have a wealth of knowledge at our fingertips. So I guess this is my first, short book report type blog. And I'm only doing this as I think it's worth doing and sharing. If know one reads it, it's a journal entry for me at least. I've recently just finished reading The Book of Joy by Douglas Abrams. I first heard an interview with him on the Rich Roll Podcast a couple of months ago and then searched it up at my local library. I was stoked to find it down at our beautiful Campaspe Library in large print. I love reading books in large print, it makes me feel like a power reader, smashing through the pages at a more rapid pace. The book covers a bit about their own stories (some awesome reading in that alone) and lists 8 pillars to finding joy. I felt it was very relevant to the world we live in today and have shared them with you below. There isn't much rocket science about the pillars, just simple things we can remind ourselves to do everyday to make our lives more joyful. I'll be trying to set goals and nail a few myself in the coming months. Now you don't need to read it yourself, but if you do want to, I'd highly recommend it. *Perceptive: There are many different angles. *Humility: I tried to look humble and modest. *Humour: Laughter, joking is much better. *Acceptance: The only place where change can begin. *Forgiveness: Freeing ourselves of the past. *Gratitude: I am fortunate to be alive. *Compassion: Something we want to become. *Generosity: We are filled with joy. 'That will be hard to top' were the words a wise Steve Gray said to me just as the year was finishing up on my 29th Birthday, which just happens to land in the days leading up to New Year's Eve. In 2016, I visited 8 different countries. Ran a 2.21.53 marathon, which was just short of a 5 minute PB. Bought our dream house and rented out my old one meaning I successfully dealt with the constant phone calls from banks, solicitors, pest inspectors and builders. Finally won a major Fun Run in Melbourne being Run Melbourne Half Marathon. Played a key role as an Ambassador in helping to raise $81,000 for Community Living and Respite's Opening Doors Project. Ran 7300kms over 513 hours, an average of 140km per week. Had a massively successful year at work in my role as Classroom Teacher/Deputy Principal/REC. Our enrollments are up, it was the best senior school PAT Maths/Literacy and Naplan data I've seen and an overly smooth year with some very successful key events. I signed a key sponsorship deal with the Moama Bowling Club and Getfitco. I signed on as running conditioning coach with the Echuca Football Club. We hosted our first combined Family Christmas with Carley's family and mine. Had public speaking gigs for Spreading the Good Stuff, The Moama Bowling Club AGM, Echuca Football Club and the GV Student Leadership Day. And they all look good on paper in reflection. 'Oh what a year you've had' has been said at least once in the last couple of weeks. All those outcomes from 2016. We sit back and reflect on a year looking at all the things we've achieved. For me it's even taken me a week to put this blog together, fine tuning it and wondering what direction I'll take with it. Which made me think, we focus too much on the all the outcomes though. Not so much the process that get us to those outcomes. It's because the outcomes look pretty. When we sit down at the end of the year for dinner with friends and family everyone focuses on the outcomes. To the outside person the outcomes look good and make the person feel good about themselves. It's like that iceberg image that pops up on Facebook every couple of weeks that has the success above the water and all the hard work underneath that you can't see. That's why social media can be extremely misleading. The vast majority of people, me included only put up their good looking outcomes, no one's putting up the terrible days when things aren't going so well. And, I give you the hot tip I had plenty of those in 2016. It's what really annoys me about social media and I know I fall for it and I'm sometimes a sucker for it as well, but it's only a snap shot. And, usually the very best snapshot with a load of filters over the top to make everything look even better. I've written about it before in my blog for The Riverine Herald that too many people only focus on the outcome. My 2017 had some amazing outcomes that I'm very proud of but, at the end of the day I don't know if I'd sign up to do it all again in the same way. Because to be honest there were some crap moments as well. I was constantly struggling with fatigue and low energy levels from biting off more than I could chew. So, if I could do it again would i? Hmmmm... 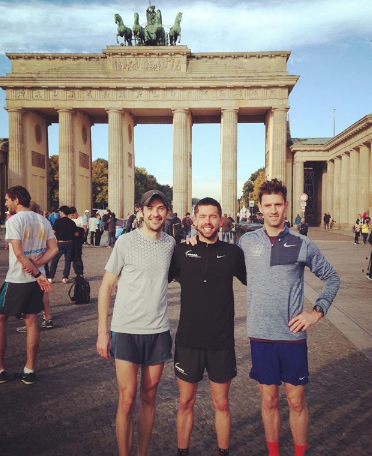 I'd love to run Berlin again. I was in great shape and it was by far my favourite running experience and such a thrill. But the process for Berlin is a different question. That wasn't as much fun as getting cheered on by thousands of Germans. The juggling of work, winter, life and marathon training was bloody hard and I wouldn't do it the same way if I had my time again. I stretched myself too thin and although I got a result I was happy with in the end it impacted on other parts of my life too greatly. I spoke the other week at Spreading the Good Stuff by The Splendid Word about how life became too much about surviving and ticking everything off the list. I'd wake up and one of my first thoughts would be 'S**t I can't wait to get back into bed tonight because it will mean I've achieved all I have on my plate for the day'. Some days I'd rush around and tick everything off; 2 runs (around 30km in total), a teaching day, some meetings and time with Carley but hardly be present in any of them with my mind racing at a million miles per hour thinking how I can get ahead for the next thing or with ideas or projects I wanted to pursue. ​It wasn't an ideal way to live for me, it may be for you and that's your decision, but you wouldn't have known that unless you were super close to me as the photos of me running fast, eating good meals or lounging by the pool on Instagram didn't show the constant struggle, the grind, the day to day. That's me doing what everyone is and only showing the good stuff. So I guess in a way 2016 is going to be hard to top but I've decided I don't want to top it. I just want to be more present in the year ahead and wake up excited for the days. I wanted to be in more races. I wanted more shoes, clothes, the newest watch, protein powders etc. I wanted to be an ambassador for more organisations. I wanted to start and be successful in my coaching business. The goals and achievements were my desires. So in conclusion, for me 2017 is going to be simpler. I've made decisions already to lessen my workload which will help me in many ways. It will cost me financially but will reward me spiritually. It will mean I can increase my training load and recovery. It will also give me time to pursue some ideas I've had that always get put onto the back burner when I became busy. Watch this space. There is no doubt my milage needs to increase. During 2016 I averaged 140km per week. Solid but nothing special and very similar to my averages for 2015 and 2014, therefore if I want to improve I need to train harder. I can't just keep banging out the same amount of mileage and expect different and improved results. I know in my lead ups to the Melbourne and Berlin Marathon my body can handle 180-190kms per week and I need to be more consistent to hitting those bigger weeks. As mentioned above 2017 is about me becoming more present by doing less things well, rather than a lot of things okay. Both those things are achievable and I look forward to continuing to share my journey with you.